Grumbacher has continued this tradition in the manufacture of its painting mediums, by assuring that the original paint attributes are enhanced, not compromised, by their use. Grumbacher mediums thicken or thin paints without harming their adhesive, binding, or film-forming qualities, and allow artists to achieve myriad effects such as increased flow and rapid or slow drying. They also have been proven to guard against yellowing and cracking over the course of many generations. Damar Varnish — A colorless, genuine Damar varnish for use as a final protective coating on thoroughly dry oil paintings. It brings out the beauty of oil colors with an soft, even, matte finish, while protecting paintings from dirt, moisture, and scuffs. Designed to provide a uniformly fine mist, it quickly dries to a matte or gloss finish that is transparent, permanent, and will not “bloom” or cloud with age. Apply when painting is completely dry, normally within six to 12 months. One coat covers; allow five minutes between coats if a heavier application is desired. Damar Varnish contains Damar gum, turpentine, and isopropyl alcohol. Pale Drying Oil — This safe, non-toxic medium is specially formulated for use by hobbyists, decorative painters, and other artisans to reduce the consistency of tube oil colors and accelerate drying time. Because excessive use causes severe yellowing and brittleness of the paint film, Pale Drying Oil is not recommended for fine art applications. Sun-Thickened Linseed Oil — A heavy-bodied purified oil that is thicker than regular linseed oil but not as thick as stand oil, Grumbacher Sun-Thickened Linseed Oil is designed for use in preparing oil painting mediums. It exhibits an excellent resistance to yellowing and is extremely flexible. Use Sun-Thickened Linseed Oil to improve flow and increase gloss. Pre-dilute it with Pure Gum Spirits of Turpentine, Grumtine, or Odorless Paint Thinner. Copal Painting Medium — A traditional 19th century painting medium prepared especially for hobbyists and decorative painters (i.e. tole painters), Grumbacher Copal Painting Medium is made with a modern synthetic copal resin, and has all of the manipulative and drying characteristics of the original 19th century preparation. When added to oil colors, Copal Painting Medium improves flow, accelerates drying, and imparts hardness and a high gloss to the dry paint film. Because this product may cause yellowing and darkening of the colors with time, its use is recommended for occasional or impermanent painting only. Dilute Copal Painting Medium with Pure Gum Spirits of Turpentine or Grumtine only. ZEC Medium — Accelerate the drying time of your painting with this clear and colorless colloidal oil painting medium. Grumbacher ZEC Medium maintains the consistency and hue of the colors and holds any desired texture. In normal applications, paintings dry to the touch in 4 to 6 hours. ZEC should be diluted with Pure Gum Spirits of Turpentine or Grumtine only. It is not compatible with petroleum solvents, paint thinners, or odorless paint thinners. Mixtures of ZEC in excess of 1:1 will result in a brittle, dry paint film. Damar Retouch Varnish — Damar Retouch Varnish is a spray damar varnish for use during intermediate stages of development in an oil painting to even out the gloss of unfinished works, or to revive sunken in or dry areas to aid in accurate color comparison for further painting. Oil Painting Medium III — Dilutes oil color to speed drying time and improve paint flow. Add it directly to the color in small quantities. It's perfect for detail work. Oil Painting Medium I — For use with artists’ oil colors where a matte finish is desired, this medium is especially useful for under-painting on an absorbent gesso ground or for mural work. Add it directly to oil color in small quantities for increased fluidity and enhanced ease of application. Composed of poppy oil, copaiba, balsam, and solvent, it does not affect the brilliance of even the most subtle tints. Oil Painting Medium II — Formulated especially to improve flow, retard drying time, and impart a high gloss finish to the dried paint film, this is the ideal painting medium for alla prima (wet-in-wet) painting techniques. For best results, add it to paint in small amounts until the desired consistency is obtained. It contains D-Limonene and petroleum distillates, and may be diluted with pure gum spirits or turpentine. Cobalt Drier — Grumbacher Cobalt Drier is the only siccative that has been scientifically proven to be the least harmful to use for fine art painting. Cobalt Drier speeds drying of oil colors and oil painting mediums. Because it is extremely strong, Cobalt Drier should be used sparingly by applying it in drops. It should not be mixed directly into oil paints, but first mixed into an oil painting medium, which can then be added to the paint. Cobalt Drier should always be tested before using it in a painting. Japan Drier — Grumbacher Japan Drier is a reliable alkyd resin-based liquid siccative intended for use by sign painters, artisans, and craftspeople. Japan Drier is not generally recommended for fine arts applications because it has a tendency to yellow and darken oil colors over long periods of time. It is an ideal medium for oil gilding. Simply apply Japan Drier to an appropriate surface and allow it to dry to a high tack, then apply gold or silver leafing, smooth, and burnish. 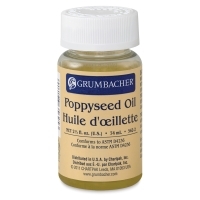 Poppyseed Oil — Grumbacher Poppyseed Oil is a purified, non-yellowing oil painting medium. When mixed with oil colors, it slows their drying rate, allowing ample time for blending and other wet-into-wet techniques. It also makes colors smoother, improves their flow, and helps level out brushstrokes. It may be diluted with Grumtine, pure gum spirits of turpentine, or odorless paint thinner. Alkyd Painting Medium — The ultimate alkyd painting vehicle, Grumbacher Alkyd Painting Medium lubricates oil color for easier surface glide, allowing for up to eight hours of painting with little, if any, brush drag. A thixotropic painting medium (the more you stir, the more fluid it becomes), it produces rich, transparent, luminous glazes and may be diluted with any conventional oil painting solvents. Odorless, non-yellowing, and archival, it dries to the touch and is ready for overpainting within 12 hours. Modeling Paste — This is a flexible, durable paste for creating textured surfaces to be over-painted with oil or acrylic paints. Apply it to canvas, wood, cardboard, plaster, concrete, masonry, and other surfaces. Damar Liquid Varnish — This is a pure gum damar that is used to enrich dry oil paintings. Quick-drying and permanent, it provides a transparent high gloss finish that also protects oil paintings from dirt, moisture, and scuffs. When used properly, it will not “bloom” or cloud with age. Apply it when paintings are thoroughly dry (between 6-12 months). It cleans up easily with paint thinner or other mild solvents. MG Underpainting White — This permanent, fast-drying Titanium White oil paint is designed for use in underpainting or in wet-in-wet (alla prima) painting. Specifically formulated to create a lean, dry paint film, MG Underpainting White has enough tooth to readily accept glazes. Other uses include creating surface textures and impasto techniques. In normal applications, MG Underpainting White dries to the touch in 4 to 6 hours and may be painted over immediately. Need to control drying time? Mix MG Underpainting White with oil colors or mediums. To dilute, mix it with Pure Gum Spirits of Turpentine or Grumtine only. Petroleum solvents and paint thinners and odorless paint thinners are not compatible with this product. Mixtures of MG Underpainting White in excess of 1:1 will result in a brittle, dry paint film.